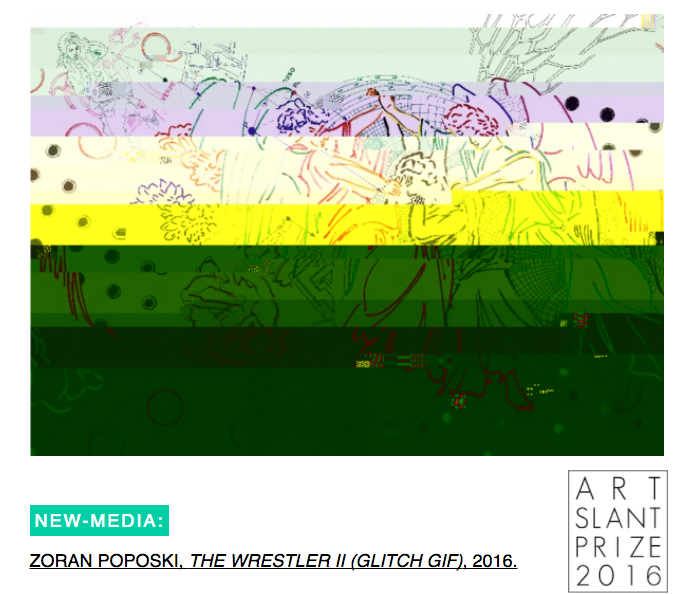 Artist Zoran Poposki's work has been selected as a Juried winner in the NEW-MEDIA Category of the ArtSlant 9th 2016 ArtSlant Prize Showcase competition, by a jury of gallerists in Miami, New York, and San Juan. The jury for the prize included: Chelsea Guerdat (Director of Operations, Apexart), Andrew Lee (Assistant Director, Sperone Westwater Gallery, New York), and Agustina Ferreyra (director and owner, Galeria Agustina Ferreyra, San Juan). The artwork is a glitch gif based on Poposki's drawing from the Theoria series, based on a mural by Delacroix.